To get into the library, you’ll need your university card – just scan it on the entrance gates and come on in! If you do forget it, don’t worry; you can print out a temporary day pass using the white kiosk close to the Welcome Point on Floor 1. If you’re unsure of anything, just have a chat with our lovely staff on the Welcome Point, which is staffed 24 hours a day. As you enter the Library, you’ll spot the Helpdesk on your left. This is staffed from 08.30 – 21.30 daily, and as the name suggests, you should visit the Helpdesk if you need any help. Library Search is the Library’s discovery catalogue which offers one search box for books, journals, DVDs, articles, digitised materials and archives. You can do simple searches by keywords, authors or titles, as well as more complex searches. There’s plenty of information on the Library’s website to help you with your searching. If you want to find a book within the library, you will need to use Library Search to check that we have it, and, you need to make a note of its classmark – the code of numbers and letters on the spine label. This will tell you where a book is located. Look out for the catalogue computers throughout the Library. The multifunctional printers print, copy and scan documents, and you’ll find them on all floors of the library. There is a cost for photocopying and printing, but scanning is free. The IT Services Helpdesk is located on Floor 1 of the Library and is open 09.00 – 17.30 on weekdays and they have loads of information on their web pages if you get stuck. You’ll find this area next to the printers on Floor 1, and you can use it if you need any assistive technology – such as note-taking, mind mapping or text-to-speech software – to support your studies. The furniture is adjustable too! Although this area can be used by any student, it is primarily for staff and students registered with Disability Services who can also book one of our Accessible study rooms. While you’ll find the majority of books on the upper floors, you’ll see that some are kept in our Short Loan collection on Floor 1. These are the books that are in particularly high demand, so they have a very short loan period – we issue these until 11 am the following weekday. You’ll also spot the self-collect holds shelf in this area. If you have requested a hold, when it is ready for you we email you at your Warwick email address and you collect it from here. Once you’ve found the books you want, you’ll need to borrow them using the self-issue machines on Floor 1. Follow the instructions on the screen, and make sure you take your receipt, as this will tell you when the books are due back. We may need to change the due date if the book is in high demand and another student has placed a hold; if this happens, we’ll email you at your Warwick email address to let you know. Once you’ve finished using your book, you will need to return it in the returns machine. Place books on the belt one by one, and they will be whisked away and removed from your library account. 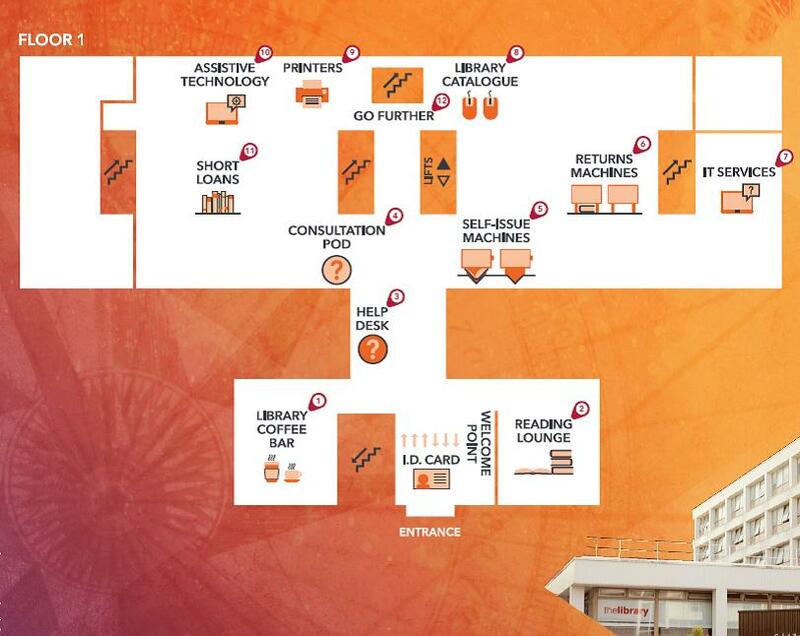 Whilst most of what we’ve discussed so far is on the first floor, don’t forget to check out the rest of the Library. The library has a further four floors, offering a range of study spaces to suit different people’s needs and has rules about food, drink and noise in the various zones. Look out for signage to find out what you can and can’t do. As a general rule, floors with book stock are either quiet or silent. Don’t forget: we have other Library spaces such as the Learning Grid University House, Learning Grid Rootes and Learning Grid Leamington, as well as the PG Hub for postgrads, the Wolfson Research Exchange for researchers and the Biomed Grid at Gibbet Hill for biological scientists and medical students. So there you have it: the library’s key locations. However, we’ve only scratched the surface of what we have to offer. There’s a huge range of support and help on offer, from Study Happy events to Academic Support Librarians, so make sure to visit us.